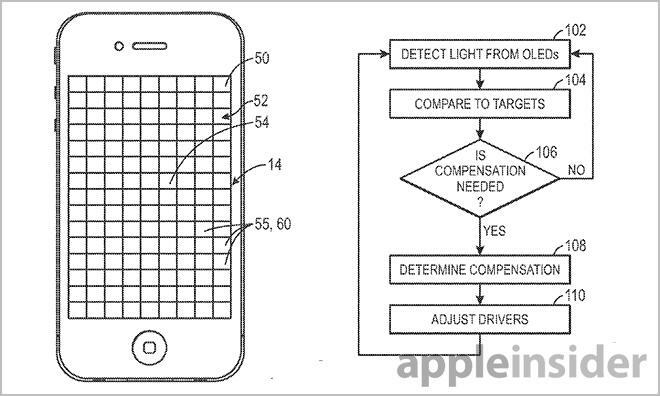 The U.S. Patent and Trademark Office on Thursday published an Apple patent application for an OLED display that uses built-in detectors to dynamically adjust output at select areas of the screen, compensating for ambient light fluctuations or aged diodes. While Apple has yet to deploy a device with an organic light emitting diode (OLED) display, the company is looking into solutions for issues inherent to the technology, such as OLED color changes due to old age. The patent filing also covers advanced techniques in sensing and compensating for ambient lighting. OLEDs offer a number of advantages over the LCD panels used in most of today's consumer electronics applications. One of the main benefits is that an OLED can emit its own colored light, making display assemblies thinner and lighter while retaining good viewing angles. As seen in other Apple patent filings, OLEDs can also be disposed on both rigid and flexible substrates. However, unlike LCD displays, OLEDs degrade quickly, meaning some diodes may "age" differently than others, thus affecting light output. This effect is sometimes referred to as "image persistence." 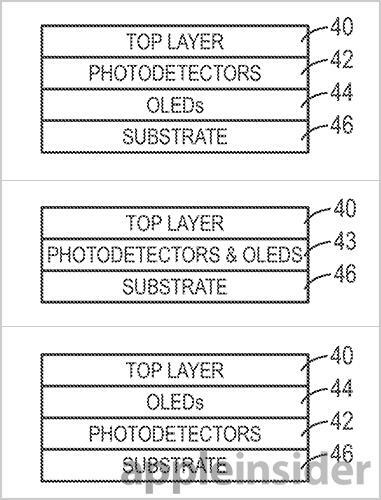 Apple's patent application for "Organic light emitting diode having photodiodes" describes a setup that places photo sensors above, below, or in line with an OLED array to detect and compensate for these changes. In some embodiments, the photodiodes are located in just certain areas of the screen, while other embodiments have them interspersed throughout the panel. Using data from photodiodes, a controller can detect variations in emitted light under various conditions. For example, ambient light information can be collected by the photodiodes. If a display area is dim, denoting a darker environment, the controller can adjust output accordingly. Because the sensors are part of the display rather than adjacent to it, as is the case with the ambient light sensor in the iPhone and iPad, the data is much more accurate. The patent takes into account that, in many cases, a single light measurement isn't enough. For example, a single ambient light sensor would be insufficient to detect a situation in which part of a screen is shaded, while the rest of the display is being hit by direct sunlight. With photodiodes, the shaded zone can be driven with less power than the unshaded area. The patent notes that photodiodes can also gather information about individual OLEDs or pixel groupings, measuring their output against a reference signal or other OLEDs with known outputs. If an OLED is determined to be aged and is no longer reproducing colors or brightness in concert with surrounding diodes, the controller can drive that specific component at a different strength to compensate. Cross section view of possible OLED layout. The inclusion of photodiodes can also be used to make the display more useful. For example, the system can take the place of current proximity sensors, creating space for additional components. In one embodiment, the patent application notes that photodiode-equipped screen may only shut off those OLEDs that are directly obscured by a user when the device is up to their ear, leaving the rest active. 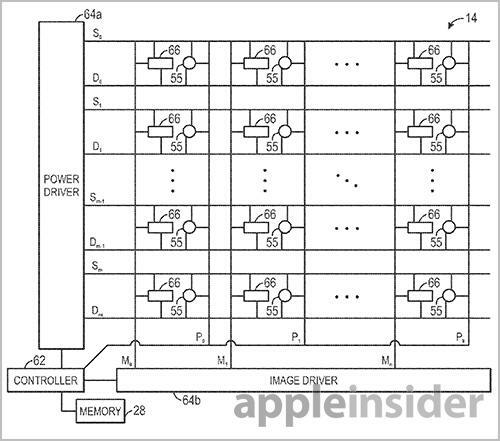 Apple's OLED panel with photodiodes patent application was first filed for in 2012 and credits Stephen Brian Lynch, Paul Stephen Drzaic, Benjamin Mark Rappoport, Fletcher R. Rothkopf, John Patrick Ternus and Scott Andrew Myers as its inventors.